Use on Power or Sail vessels up to 65'. 2 mile visibility. ABYC, USCG, IMO, RINA certified. 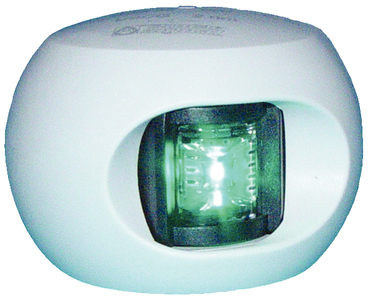 Operates on either 12 or 24 volt system without modification. Completely sealed and waterproof. EMC tested and certified for radio interference. Energy efficient LED technology significantly reduces power draw compared to incandescent lights. Includes degradation sensor. 2-3/4"L x 1-3/4"D x 2"H. White housing.